This entry was posted in Sync Optima Events and tagged drift challenge 2008, malaysia drift, malaysia drifting on December 31, 2008 by skagee. ..there’s nothing like hanging out at the garage ,waiting for friends to arrive.. Watching friends changing the dreaded front tyre puncture with minimal fuss….. This entry was posted in Life Style on December 29, 2008 by skagee. Pictures of the coverage of the Jebat Drift King Challenge 2008 is up in forum. 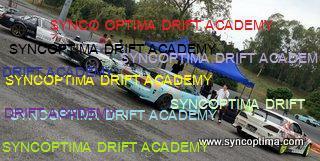 This entry was posted in Sync Optima Events and tagged jebat drift, malaysia drift, malaysia drifting on December 23, 2008 by skagee. Bridgestone’s Tan Tat Wei takes the crown for round 2 , with Falken’s Zulfika taking second once again. Johan Norman of Goodyear despite of a failing engine takes third. Fourth goes to Johari Mat Salleh, fifth to Federal’s Mervyn Mohd.While sixth goes to Wan Boss and seventh and eight goes to Derrick and Burn respectively. More update later.. This entry was posted in Sync Optima Events and tagged bridgestone, drift, Drifting, falken, federal, Goodyear, goodyear racing, malaysia drift on December 21, 2008 by skagee. Since Cheaka’s services won’t be needed for this time around, she will be participating for this round in the expert catagory. I’m sure everyone will be assured that my judging towards her runs would not be bias :). Speaking of judging, I have decided that this would most probably be the last time I would be judging for this series as I plan to compete in it next year. I have full confidence in Loyai and crew to be able to fill in once I leave. For this round competitors and spectators alike will be treated to a new addition to the MC’ing with the inclusion of Nadia who is currently learning the ropes for our very own ‘Mat Cakap’ Wanbra. It begun to rain 15 minutes before the session ended at 6.30pm. Needless to say , a majority of the drifters took the opportunity to practice under the wet condition which will prove to be useful if it rains tomorrow during the competition. Tomorrow another offical practice will take place at 8.30 am ,followed by the qualifying and tsuiso battle. Hope to see you there.. This entry was posted in Sync Optima Events and tagged drift, Drifting, malaysia drift, morac speedway on December 20, 2008 by skagee. Hi guys. In light of having to post up results of our competitions, events , general news and updates promptly ; we have decided to start up a blog. I will try to keep stuff here short and sweet and post the full coverage in our forum section. This entry was posted in Uncategorized on December 17, 2008 by skagee.